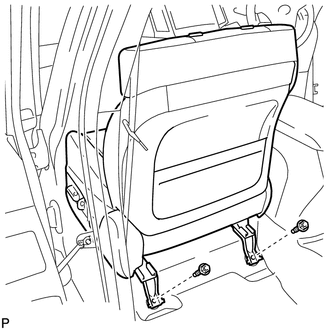 If the front seat side airbag assembly was deployed, replace the front seat side airbag assembly, front seat frame assembly with adjuster, separate type front seatback cover and separate type front seatback pad with the necessary parts in accordance with the extent of the collision damage. (a) Operate the slide and vertical power seat switch knob and move the front seat assembly to the foremost position. 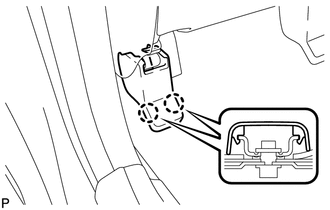 (b) Disengage the 2 claws and remove the front seat rear outer track cover. 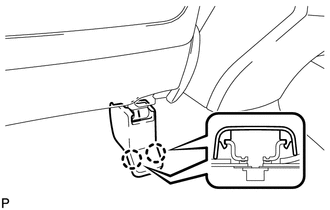 (a) Disengage the 2 claws and remove the front seat rear inner track cover. (a) Remove the 2 bolts on the rear side of the front seat assembly. 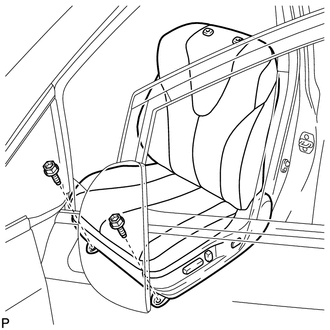 (b) Operate the slide and vertical power seat switch knob and move the front seat assembly to the rearmost position. (c) Remove the 2 bolts on the front side of the front seat assembly. (d) Operate the slide and vertical power seat switch knob and move the front seat assembly to the center position. Also, operate the reclining power seat switch knob and move the front seatback assembly to the upright position. (e) Disconnect the cable from the negative (-) battery terminal. (f) Disconnect each connector under the front seat assembly. (g) Remove the front seat assembly.